You almost fell to Code B. How do you feel about winning? My hands are still shaking. I was more nervous than when I was in Code S ro4. It was really hard. In Set 2, I thought I was in an unlosable position but my opponent defended so well. I wasn’t too confident about Set 3. I am confident in TvT during practice. However, weirdly, I lose helplessly on broadcasted matches. I must be meant for the stage (T/N: sarcasm). Also, after ro4 last season, my TvZ was on a decline. In such a situation, I met Terrans and Zergs which led to my elimination. Also, I think I am weak against StartaleCurious in particular. Players fear falling down to Code A. How is it now that you’ve experienced it? I was as nervous as a player playing his debut match. 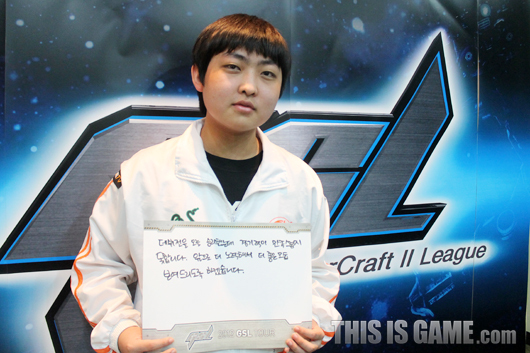 It was harder than when I first got into Code S. It must be because I keep thinking I have something to lose now. It was short but you had a break. What did you do? I practised a lot. My skill seems to have dropped lately. Are you confident about making it back into Code S? As long as I make Up and Downs, I’m fine. There is a good chance of me returning. Since, I’ve done well in Up and Downs so far, I am relieved that I’ve secured a spot in Up and Downs. Of course I want to play him. However, I’m not supposed to cheer him on in an interview. Someone told me that it brings bad luck. Shouldn’t you reinforce your TvZ? I keep practising TvZ but it’s still hard. I don’t even think I’m at a level where I can practise against Leenock. It feels very low level. I should bring it up by myself somewhat before I can have good practice against better partners. I want to thank FXOBoss and Razor who are sponsoring us. I also want to thank FXOChoya who always comes to the studio with us. But it’d be nice if he drinks less in the future. This is your first time advancing to Code A Round 2. How do you feel? Glad. I’ve made Code A three times so far and never made it further. I am glad that I’ve secured my spot for next season but it’s a bit so-so. Every time I see the bracket, I think that I have the worst luck in the world. First time in Code A, I played IMMVP, next, I couldn’t even play the games I prepared because I lost early on. Now, it’s against a teammate. I was taken by surprise by an unexpected build. I wasn’t able to react properly. You succeeded in coming back by taking two sets in a row. Your micro in particular was great. My condition wasn’t that great. I was just lucky. It felt like he was going for DTs in Set 2 so I made an observer and that was key. Who do you want for next round? I hope my friend makes it. I am friends with MVPVampire. Then again, playing against a friend has its downsides. How far are you planning to go this season? Since I beat Inca, the plan is to get into Code S. I have to play for Inca as well now. I want to bypass Up and Downs and go straight into Code S.
It hasn’t been long since you joined oGs. How is the team atmosphere? It’s been around a month. Everyone is nice, teaches me a lot, is fun and the atmosphere is great. I think I’ve practised more since joining the team. I want to thank my parents who always cheer me on. King of Survival Yugioh, how does it feel to cheat death once more? After I lost in the Up and Downs last season, I think my personality changed a lot. On that day, being eliminated like that, I had tears in my eyes. Even before I played today’s matches, those memories hurt. However, I wanted to do better so I slept less and to stop myself from swaying, I entered the training house. Today was the first official match in a long time. How was it? I’m ashamed to say that this kind of play is the result of sleeping only 3-4 hours per day and practising. I practise the most in the training house but my play doesn’t seem to reflect that which disappoints me. Which aspect were you so unhappy about? I remember thinking that I’d nearly lost Set 1 so I think I won only because of luck and my opponent making a mistake. My father advised me not to get too ahead of myself even if I took Set 1. If I lost Set 1, it would’ve been difficult. What do you think is the reason for your lacklustre play? The stress keeps piling on but there is no way for me to get rid of it. Not being able to get rid of stress is a real problem. I am sure this is the cause. Puzzle practises a lot less than me but has a lot of ways to unwind. I knew what kind of psychological pressure I would be under if I lost on the day. So the loss was hard to accept. It was regrettable to lose like that after taking the Up and Downs very seriously. You said you entered the training house, have there been many changes? I usually try to play games in a quiet area but since I am good friends with teammates, that kind of practice is hard (laugh). Since there is a set pattern of activities in the training house, practice is guaranteed. I like that aspect. Do you think you can return to Code S? I am entering the training house to solidify my determination. I know how each and every loss affects me. The sacrifice I make to practise is nothing in comparison. 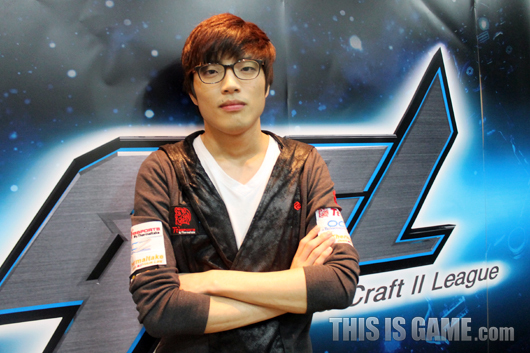 I want to return to Code S and win the championship as soon as possible. I had a collapsible bed in the practice room which was uncomfortable. Then, SlayerSJessica bought me a new mattress so I am sleeping well. I am grateful. I play the game in a very boring way so I am thankful to my teammates for tolerating me. I want to thank the Protosses on my team as well. How does it feel to win your debut match? I am delighted. However, I kept getting supply blocked and didn’t spend my resources straight away so I’m not too thrilled about my play. 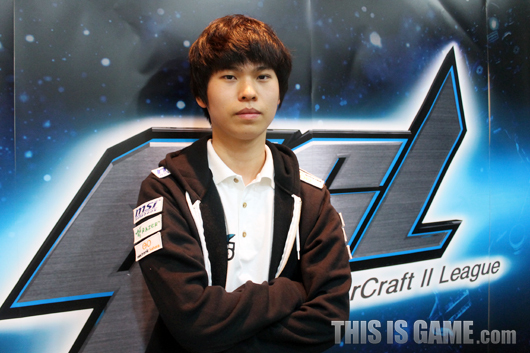 Was there a precipitating factor for your becoming a Starcraft 2 progamer? I tried to become a Broodwar progmar but switched once Starcraft 2 was released. I found the game interesting so I decided to become a progamer. When did you join FXO? It was around autumn last year. I entered after getting through the entry tests. I was part of fOu in the past and stayed in MVP for a while too. In the end, I joined FXO. How long have you been trying at the preliminaries? I’ve tried since Open Season 2 but never made it. Lately, I’ve gotten a lot better and gained a lot of confidence. I’ve improved gradually. I was a little nervous but confident that I could win. I am more confident about TvP than my other matchups. What kind of player do you want to become in the future? I want to be the best. I want to be like leenock. He’s a big brother to me but at such a young age, he’s so smart and players better than other players. I admire that. I want to thank FXOBoss and Razor for sponsoring us. I want to thank FXOChoya and FXOSupreme who always take care of us. I want to thank players who helped with practice: FXOTear, FXOWeekend, and ZenexAvenge. How does it feel to reach Code A Round 2 for the first time? I feel better than I expected. I am happy about the fact that I don’t have to go through the preliminaries next season. For someone in Code A Round 1, he’s a powerful opponent. I was concerned initially but gained a lot of confidence through practice. We suspect you must have some expectations about this season. You’ve already proved yourself in GSTL. It’s my goal to go straight to Code S. I believe I can. You’re doing great in GSTL and now in the individual league. What’s the secret? 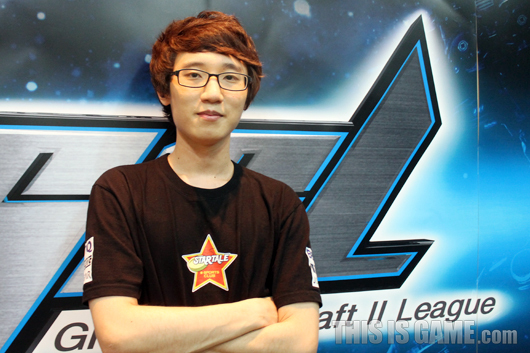 I worked hard too but honestly, Protoss seems a little strong at the moment (laugh). The hard times have passed. I’m living it up nowadays. The nexus at my expansion was destroyed. To be frank, I knew I’d lost once the all-in was held but since it was a broadcast I put everything I had into the defence. Your next opponent is FXOGumiho. What do you expect? Gumiho has a very peculiar play style. It will be hard to prepare for him but my confidence in PvT will carry me through. Will you get into Code S without going through Up and Downs? I’m not sure yet. However, if I meet a Zerg in Round 3 after beating Gumiho, I think it’s possible. I want to thank our sponsors MSI and Razor. I want to thank my teammates and players who helped with practice: MVPSniper, MVPMonster, ZenexLife, and SlayerSCoca. I prepared the matches specifically for Alicia’s play style. However, He didn’t play as I expected so it was a little difficult. You’ve been to Code B, how is it? Reaching the bottom, I feel like I realised where I stood. It wasn’t because I was unlucky but because I wasn’t good enough. It was hard work but if you were to evaluate your games today? Set 1 was okay but there were a lot of mistakes Sets 2 and 3. I lost too many units unnecessarily doing medivac harass. This made the games difficult. Have you improved a lot? I’m trying hardest on my team. It used to be Curious but now it’s me. I felt even in practice that I wasn’t playing my best. I think it really was a slump. However, it’s fine now. It must’ve been the lack of practice. In October and November last year, I wasn’t able to get a lot of practice done and the effects from those months seem to have caused my elimination. Shouldn’t you get back into Code S? I want to stop playing in Code A. I want to return quickly. I think I’ll get back straight into Code S.
Your next opponent is Zenio. Can you get to Round 3? I want to beat Curious in Round 3. In the current bracket, we should be able to meet and didn’t I go to Code B thanks to Curious? To have my revenge, I will beat Zenio. Do you worry about your play style? I feel myself that my style has been figured out a lot by other players. I lose a lot to counter builds. I try to be diverse. However, today, today was all doubles (laugh) (T/N: what the heck does this mean? Did he use builds that involved ‘double’ something?). I want to thank NSHSTassadar, Squirtle and Tiger for practice. I want to thank our sponsors Red Bull, BenQ, Zowie and Zowie Gear. I am glad to make Round 2 but I am sorry about beating Avenge who is very close to me. You won 2:0, was this expected? Set 3 was on Entombed Valley so I had to win 2:0 no matter what. There is no answer for Entombed Valley. ZvP is quite unfavourable for Zerg. How is it for you? Mutalisks used to be useful but nowadays it’s difficult. Once the mutas hit the field, the phoenixes are ready with the range upgrade. How did you prepare for today’s games? I tried not to use mutalisks but I was forced into them in Set 1. They are counterable so I try not to use mutalisks in general. You have fallen just short of Code S many times. I’m not sure about how confident I am but I feel like I must get into Code S this time. 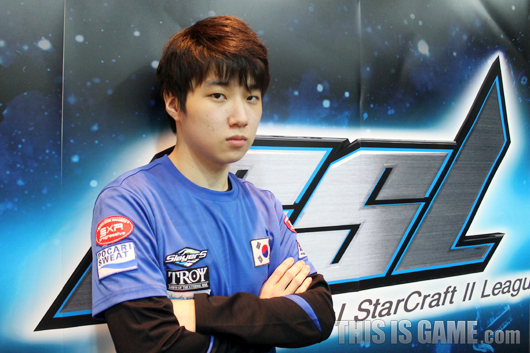 I am disappointed by the fact that I’ve never been in Code S yet. Your next opponent is Curious. How do you feel? I don’t like ZvZ much and I’ve lost helplessly to him before. I think I’ll have to practise a lot. Is ZvZ your biggest weakness? It is. My match against Curious is the biggest hill to climb this season. Round 3 is already a big worry. I may have to go through Up and Downs. How about getting some help from DRG? DRG’s losing a lot himself right now (laugh). I want to thank IMSeed, oGsVines and my teammates who helped with practice. I want to thank my family and relatives who cheer me on. I also want to thank Razor, our sponsor and our partner MYM. How does it feel to win in the GSL after 218 days? It’s fantastic. I am sorry to Coca. Your opponent was Nada of all people. What did you think? He’s someone I’ve beaten last time I was in Code S ro4 so I didn’t think too much of it. However, today’s games didn’t go as I expected so it posed a bit of a challenge. I was expecting mech but he went bio. There was a lot of pressure since there weren’t teammates to rely on. However, I wasn’t nervous like in GSTL. I spent too much time on the ladder during my time of reflection so I was well prepared against bio too. Does it feel like you are fully back? There are many who have their eye on me yet. I think I should behave myself for a bit longer. It doesn’t feel like I am fully back either. 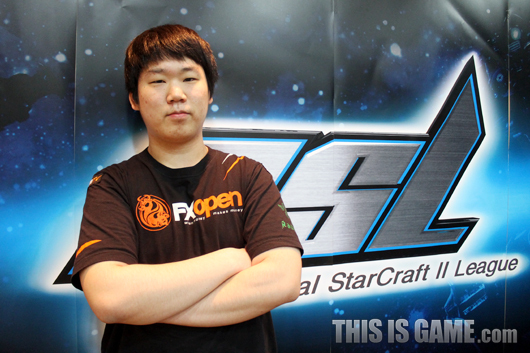 I will only think that once I am back in Code S.
What is your skill level compared to when you were in Code S ro4? My skill level is much higher now. However, back then I never got nervous. I think I’m under pressure now. Your next opponent is FXOTree. He’s a newbie, how will you prepare for him? I think I will lose. I’ve met him on ladder a few times and he’s good. There’s no need to worry about Code B now. Any chance at returning to Code S? I will get back into Code S 100% as long as I play like I did today. I’m not too sure about ro4 yet though (laugh). 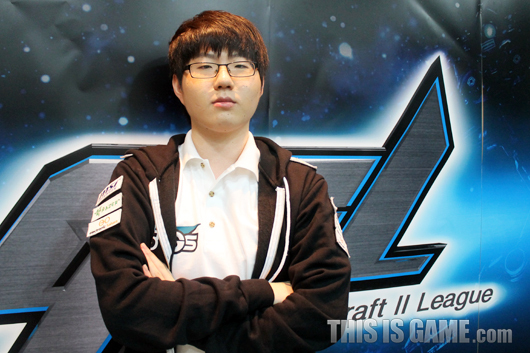 First, I want to go straight into Code S this season. 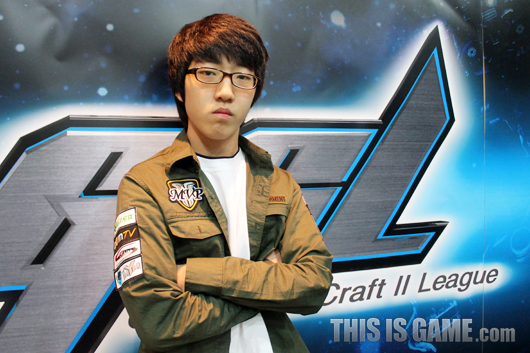 Tomorrow is MKP’s match. If MKP drops to group 4, there’s a chance he’ll meet me. I hope he makes ro8 no matter what. I met Boxer in the waiting room today. I thought he wouldn’t be too fond of me but he spoke to me first about the incident with Coca and told me that Coca will work harder if I do well. I value his advice and it helped me today. I also want to thank Maru who helped with practice. Uhm GSL starts in about 50 minutes but we already have a winner interview? This is from the first set of games. Can we call Choya drunkentoss? Will these games be played? Interesting that InCa lost in a PvP and against a newcomer to boot. But they're team mates, so I guess Lure had his number. Anyways, thanks for the quick translations! Thanks any idea when last four will be out? Can't wait for Byun interview! Thank you so much for all your translation storywriter, you rock! yugioh survives while 2 of his fellow teammates have fallen.